Whether you have a head full of curls that you just can’t seem to tame or fine, straight hair that’s always getting in knots, these at-home solutions will help you get and keep the tangles out. 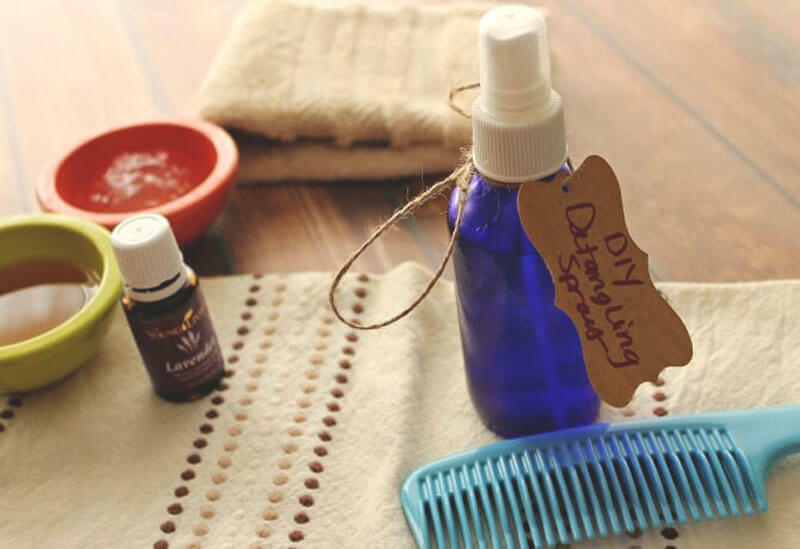 The best DIY hair detangler recipes are quick and easy to make and will help you the smooth, tangle-free hair you’ve been dreaming of. If you’ve been struggling to find the right detangler for your hair, then check out our list of do-it-yourself recipes that you can tweak to fit your needs and preferences. And we keep it simple, providing you with all of the tools you need right at your fingertips. Purified or distilled water to dilute the mixture of essential oils and vinegar. Apple cider vinegar with the mother to make sure you’re getting all of the added benefits of the recipe. Rosemary essential oil which serves to soften and fragrance the hair. Lavender essential oil that also serves dual purposes of nourishing and relaxing the hair as well as lightly fragrancing the mixture. Raw, organic apple cider vinegar to provide you with the maximum benefit from the detangler. Pure lavender essential oil not only has a nice fragrance, but it also has several inherent properties that eliminate tangles and soften the hair. Distilled water keeps the solution pure while diluting it enough to make it easy to use. Raw apple cider vinegar delivers a powerful punch of probiotics to the hair to loosen tangles while maintaining the integrity of your hair. Pure aloe vera gel calms any scalp sensitivities while working to lubricate tangles and reduce hair issues. Distilled water dilutes the solution making everyday use as simple as a spritz. Pure essential oils, like lavender, lightly fragrance the mixture while also softening the hair and soothing the scalp. Unrefined coconut oil softens and moisturizes the hair and scalp to make combing through your hair easy and painless. Extra virgin olive oil nourishes from root to tip to loosen any matting and make detangling a snap. Warm water serves as a vehicle for the solution and makes application quick and easy. Raw apple cider vinegar to balance the pH of your scalp and stimulate hair growth naturally. Almond oil contains rich fatty acids that both soften and add shine to your hair while it loosens stubborn tangles. Pure rosemary essential oil is known for its benefits to hair growth and is packed with powerful antioxidants that reverse thinning and treat underlying scalp issues. Aloe vera helps maintain the collagen in your hair follicles and helps maintain healthy hair growth while it loosens stubborn knots. Glycerine restores moisture to dry hair and prevents breakage as it detangles. It also helps reduce split ends. Distilled water serves as a vehicle for all of the ingredients to simplify application. Pure jojoba oil hydrates the hair and naturally mimics the oil your scalp naturally produces to lubricate the hair and follicle. Lavender essential oil relaxes and calms while it soothes the scalp and gently releases tangles. Distilled water is the ideal way to dilute these ingredients to make everyday application a breeze. Marshmallow root naturally smooths, soothes, and strengthens the hair. Apple cider vinegar restores the natural pH of the scalp, solving any underlying issues that may be contributing to hair issues. Extra virgin olive oil nourishes the hair as it loosens knots and tangles to complete this perfect DIY hair detangler. Bonus tip: If you really want to tame your hair, you can also try a natural leave-in conditioner to de-frizz your hair and help smooth it. Brushing your hair doesn’t have to feel like a battle every single day. And while other conditioners and detanglers may help, their chemical properties and cost often make them a far reach from a good “solution.” These DIY hair detangler recipes are the best of both – free from unnecessary ingredients and toxins and cost-effective. 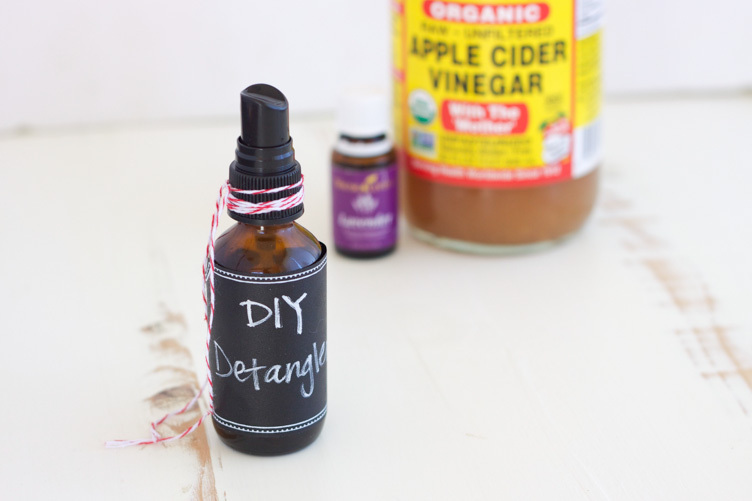 With a few key ingredients and a glass spray bottle or two, you can have a safe, effective DIY remedy for getting even the most stubborn knots and tangles out of your hair.